This Web site allows you to access the practice tests for the Ohio Graduation Tests. If you are taking a test assigned by your teacher, you will need to log in. If you just want to browse the practice tests available, you may do so without logging in, or you can create a new account. This Web site allows you to access the practice tests for the Ohio Graduation Tests that your children will take. Your site is the same as the Student Site. If you wish to take Practice Tests and keep track of them, you will need to sign up for a new account or log in. If you just want to browse the tests available, you may do so without logging in. This Web site allows you to access the practice tests for the Ohio Graduation Tests. If you are creating test assignments for your student(s), you will need to log in. If you want to browse the practice tests available, you may do so without logging in, or you can create a new account. From the Practice Test page, Click Sign Up For New Account. Enter your Personal Information (first name, last name, and e-mail address). Note: Your e-mail address is required to reset your password (in case you forget it). For Teachers: Enter your District/School Information (your district and school name and phone number are required fields). Students and Parents will be directed to the Portfolio page. Teachers will be directed to the Teacher Workbook page. From the Practice Test page, enter the User ID your teacher gave you and click Sign Up For New Account. Enter your Personal Information (e-mail address; your first and last name fields should already be filled in). From the Practice Test page, enter your User ID and password. From the Practice Test page, click Forgot Password. Enter your User ID and click Reset my password. Check your e-mail for the new password. Note: if you do not see an email, check your spam folder. Sign in with your User ID and new password. You can change your password later in Account Information. 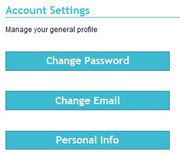 After you have logged in, you can change your account information. At the top of any page, click the "My Profile" button next to "You are logged in as ______." You will be directed to the Account Settings page. Click Change Password, Change Email, or Personal Info. Enter your new password, e-mail address or personal information. Click Save/Update to enable the new setting(s). See Released Questions enables you to view individual released questions for each test and year. Please note that questions are grouped by content standard, not in numerical order. From the applications page, click See Released Questions. Click the subject for which you want to see questions. Click the year for which you want to see questions. Navigate between questions using the Previous Question and Next Question buttons. The "My Portfolio" page gives you access to all tests and results. Logged in users can track their tests and results from this page. take a full-length practice test on your own. To begin a new assignment, click the Start button that corresponds with the name of the test. To continue taking a test you have not yet completed, click the Continue button that corresponds with the name of the test. To join an assignment, you need the Assignment ID number. Obtain the number from your teacher and enter it in the Assignment ID field. Click Join Assignment. Note: If your teacher requires approval to join the assignment, you will see "Waiting for Approval" in the Status column. Otherwise, you may go ahead and start the test. To view the results of a completed assignment, click the Results tab. Find the test, and click the corresponding View Results button. You may print out the results page for your own reference or to hand in to your teacher. To re-take a test, click the corresponding Try Again button. Note: Your score will not replace the previous score. When you view results for a test you have taken more than once, you will be able to view the results for each attempt. Click Take a New Test. You will be directed to the Take a Practice Test page. Click the plus sign next to the desired subject. Click the year of the test you want to take. You will be directed to the Practice Test Instructions page. Click Start Test to access the interactive practice test. To skip a question, click Skip Question (not available on computer-generated adaptive tests). To return to a skipped question, select it from the "Skipped Questions" drop-down list. When you have completed your assignment/test, click Submit Test and view your results. Click Select Existing Practice Test. You will be directed to the Select a Test page. Select a Subject and Year from the list. You will be directed to the preview page showing the entire test. Click Create Assignment. You will be directed to the Practice Test Options page (see screen shot below). Enter a name for your assignment (this is the name your students will see in their portfolio). Click the calendar icon to select a due date. Select whether students can join the assignment (no; yes; or yes, but with approval). To turn off automatic display of answers, click the check box (if you do this, students will not know if they answered a question correctly). If you want students to be able to view all questions associated with a passage on one page, click the check box (for existing practice tests only). Enter any additional test instructions you may have. Click Create Custom Practice Test; you will be directed to the Select Questions for Test page. 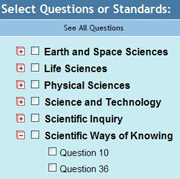 Select a Subject and Year; the list of available questions for that test will appear. Click the boxes for the questions you wish to select. You may click the title categories (Question, Format, Strand) to sort the questions for that category. Click Save Selections; the number of questions chosen for that test/year will appear in parentheses next to the active test. 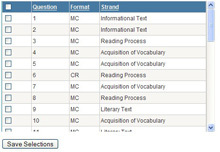 To add more questions, select another Subject and Year and repeat the above steps. To finish and preview the question list, click View Selected Items. Give your custom test a name and click Save Test Name. You may reorder your questions manually or click Drag and Drop Reorder to enable interactive question reordering. Note: Drag and Drop Reorder is supported only for Internet Explorer 6.0 and above or Mozilla Firefox 1.5 and above. To remove questions, click Remove. To add more questions, click Add/Remove Questions; this will redirect you to the Select Questions for Test page. To view the questions you selected, click Preview Questions. Click the question numbers in the left-hand list to see each question. When finished, click Go Back. To complete your custom test, click Finish. You will be directed to the Teacher Workbook page. 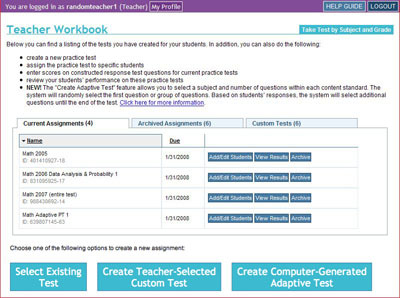 From the Teacher Workbook, click Create Assignment for the Custom Test you just built; you will be directed to the Practice Test Options page. Click the calendar to select a due date. Click Assign Students; you will be directed to the Assign Students to the Practice Test page. Note the Assignment ID number. You might want to copy/write it down (if you want students to be able to join the assignment on their own, they will need this ID number). Click the Create Computer-Generated Adaptive Test button. 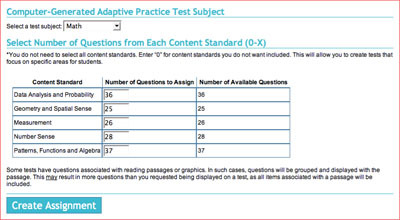 You will be directed to the Adaptive Practice Test Subject Page. Select a Subject from the drop-down list. The page will refresh to show the number of available questions in each content standard for the selected subject. Select the number of questions you wish to assign within each content standard. Enter 0 for content standards you do not wish to be included. Click Create Assignment. You will be directed to the Practice Test Options page. Enter any additional test instructions you may have (e.g., asking students to print their test results at the end to hand in to you). Create a User ID, enter the first and last name of the student, and click Create New User. Note: Students will have to enter the User ID you gave them on their log in page and click "Sign Up For New Account." They will have to fill in the remaining fields, including creating a password and entering their e-mail address, in order to gain access to your tests in their Portfolio. The student will appear under "Students Currently Assigned to Test" (see below). Enter the User ID and click Add Existing User. The student will appear under "Students Currently Assigned to Test." Under "Previously Assigned Students" click the box(es) for the student(s) whom you want to add to the test. The student(s) will appear under "Students Currently Assigned to Test." Click the Remove button next to the student's name under "Students Currently Assigned to Test." (students who joined a test using the Assignment ID code, but need your authorization to take it). Under "Waiting for Approval" you will see the student(s) who have requested approval to join the test. Click Approve next to the student(s). Approved students will move into your "Students Currently Assigned to Test" list. Click Add/Edit Students. You will be directed to the Practice Test Options/Assign Students to the Practice Test page. Click Edit These Options. You will be directed to the Practice Test Options page. 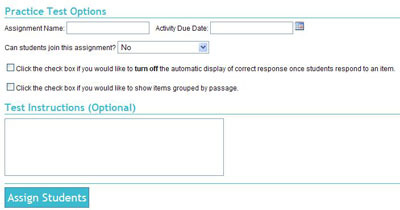 Change any of the assignment information desired, and click Assign Students. Click View Results. You will be directed to the Test Results page. Note: you can only enter CR scores for those students who have submitted their test to you. Also, you can only assign scores for the questions the student responded to (non-answered questions get an automatic score of zero). Click View/Update Score for the student whose test results you need to access. Under “Constructed Response Results,” click the number for the CR question you wish to view. Assign a score from the drop-down list. Click Save Score and Continue to view the next question the student answered. Note: You may enter the student's score directly from the results page by clicking Score; however, you will not see the student's answer. Enter the point value the student earned, and click Enter to save your score. Did this guide not answer your question(s)? Contact the OH Help Desk ! Please dial our toll-free number, 1-(888)-944-5001 or email us at OHHelpDesk@air.org. Thank you!